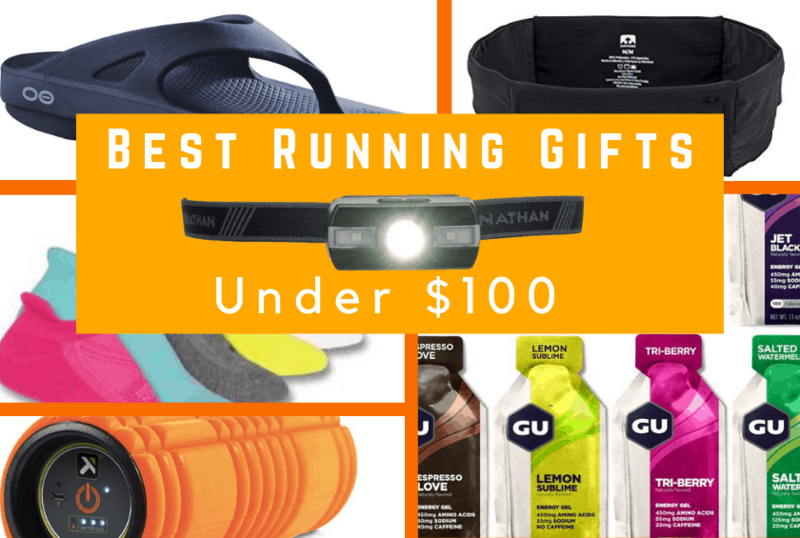 A great gift for a runner doesn’t need to cost a fortune. There are plenty of excellent options available for under $100. Not sure where to start? We’ve gone the extra mile and rounded up the best running gear that won’t break the bank. 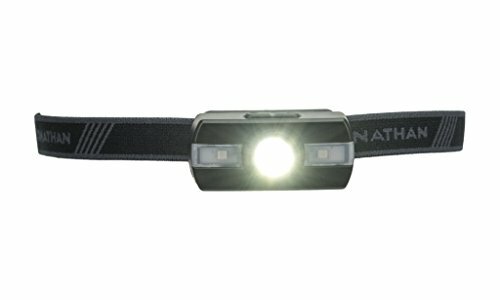 Brighten up your nightly runs with this Neutron Fire headlamp from Nathan. It not only lights up the path in front of you, but also makes you more visible to motorists. The light has a primary LED bulb that projects a 115-lumen spotlight, along with two side strobes. The strobes can be adjusted between red, green and blue light. These different colors allow you to see in virtually any lighting and weather conditions. Five lighting modes are available: low, medium, high, spring and strobe. By adjusting the settings as needed, you’ll be able to always see in front of you without unintentionally blinding motorists with a harsh light. The stretchable band keeps the light securely in place on your head. Plus, a bounce-free design keeps the light beam steady, even when running on uneven terrain. Three AAA batteries provide about 30 hours of power. Aside from all-around durability, the headlamp is also water resistant. 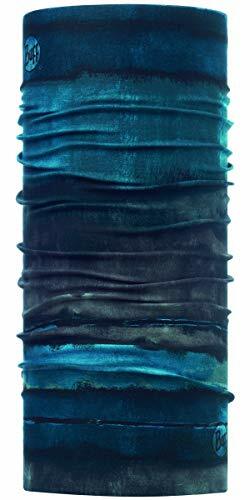 The Original Buff is a versatile tube of cloth that can be worn in 12 different ways. It can serve as a scarf, headband, face mask, hat and more. It’s ideal for keeping you dry and at the right temperature in a huge variety of weather conditions. The Buff is made from 100% microfiber polyester. A special fabric treatment is used to control odors. The seamless fabric is also quick drying, breathable and has a UPF rating of 50. One size should fit most adults. The total dimensions are 20.5 inches by nine inches with a weight of just 1.4 ounces. The versatility is the main feature here. You can use to Buff to protect you from dirt, rain and other potential hassles and hazards. If not needed at all, it easily fits in a pocket or backpack. 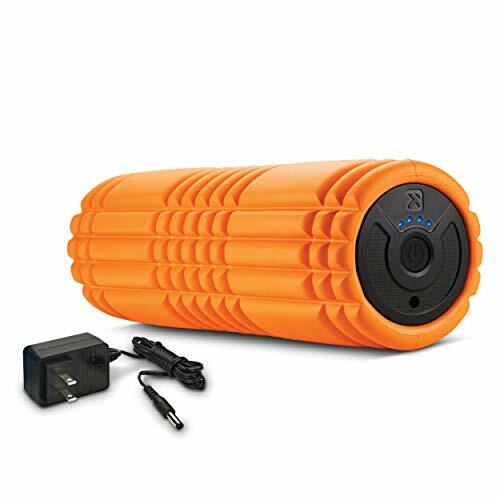 This is the latest model of vibrating foam roller from Triggerpoint. The GRID Vibe Plus features four vibration frequencies with multi-density GRID surface channels. Regular use helps relieve muscle pain, improve flexibility, and speed up recovery time. With a compact 3.5-inch diameter, you can easily target specific areas of your legs. Massaging your deep tissues helps increase oxygen and blood flow to your muscles. It helps you warm up before a run, and then cool down after. The roller is just 12 inches long with a weight of 2.5 pounds. It’s easy to travel with and store. Plus, it’s cordless. An AC charging unit is included. Traditional foam rollers are effective, but also heavily dependent on your ability to apply strong, uniform pressure. Electric rollers are usually considered not only easier to use, but also far more effective because the pressure remains the same during every use. If you want to run at maximum efficiency for long distances, you’ll need to give your body the proper fuel mid-run. 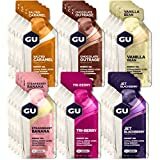 These energy gel packets are specifically designed for a runner’s unique needs. Each packet contains 100 calories, essential electrolytes, and branched-chain amino acids. They increase mental alertness while also helping to prevent muscle tears and other damage. The included maltodextrin and fructose provide quick and long-lasting energy. The variety pack includes six different flavors: Chocolate Outrage, Salted Caramel, Vanilla Bean, Jet Blackberry, Tri-Berry, and Strawberry Banana. Some of the flavors contain caffeine. Recommended use is to take one packet before you start your run and then additional gels every 45 minutes during activity. The gels are smooth and easy to consume, even while running. Plus, they’re easy for the body to absorb, so you’ll have a minimal risk of cramping. The EDC is a handheld water bottle designed specifically for runners. Made from AirRip mesh, the flask is soft, durable and easy to hold. A vector strap provides a variety of different holding options. 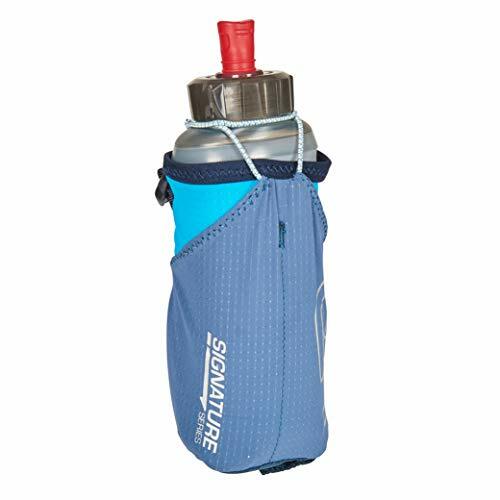 The flask holds 23.6 ounces of water, which is usually enough for a decently long run, but probably isn’t ideal for a marathon. At 2.5 ounces, it’s much lighter than many other running flasks. It’s a great choice if you find other water bottles awkward and cumbersome to carry. Plus, it also holds more than just water. The EDC has a small, secure pocket that can hold keys or similar items. Additional items can also fit in the side gel pouches. A cross bungee cord allows for easy and fast bottle removal. Water is often a pain to carry along on a run, but it’s also vital for both health and performance. This portable flask from Ultimate Direction is a hassle-free way to stay hydrated easily. To stay safe when running outside, you need to use your head. 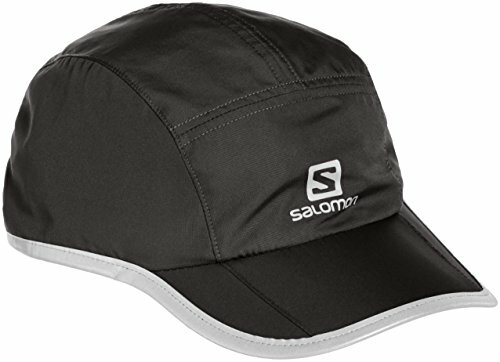 The XA Reflective Cap from Salomon doesn’t just keep the sun out of your eyes; it also helps increase your visibility on the road. Reflective trim circles the entire hat, for 360-degree visibility. The hat is made from 100% polyester with a low-profile sit and medium-length bill. The six-panel design conforms to the specific shape of your head. Additionally, an adjustable Velcro closure on the back of the hat helps create a snug, comfortable fit. Inside the hat, a sweatband keeps sweat from running down your forehead and into your eyes. The bill also blocks sunshine to improve vision. Hats are available in small, medium, large and extra-large sizes. Love to listen to music while on the move? For best results, you’ll want headphones like the Sennheiser CX 685s, which are specifically designed for strenuous activities such as running. They’re rugged, water-resistant and lightweight. Each pair is constructed with reinforced para-aramid cables and strain-relief parts. They also have a slide-to-fit EarFin holding mechanism which keeps them in your ears, even in wet weather. The sound quality is excellent. 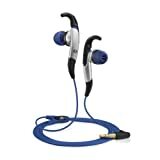 The headphones use a finely tuned 10mm transducer to create a natural sound with an acoustically closed system. They’re even sweatproof. Of course, headphones still tend to get knocked around from time to time. But the CX 685s are extra-durable and will likely be fine even if they’re accidentally dropped from a fairly substantial height. Don’t be alarmed – we’re not suggesting you run in a pair of flip-flops. Instead, these deceptively simple-looking sandals are designed to help your feet and legs recover and reinvigorate after a long run. They’re made with unique OOfoam Recovery Technology which absorbs up to 37% more impact than traditional footwear. Plus, a patented footbed design cradles your feet. Wearing these sandals helps reduce stress on your feet, ankles, knees, and lower back. They’re useful if you’re trying to heal from a running-related injury or simply want to prevent one. The first thing you’ll notice when you slip them on is how comfortable they are. A soft toe post is designed to prevent chafing, while the foam footbed conforms to the specific shape of your foot. Plus, they’re moisture and odor resistant. Walking around in these sandals helps reduce muscle cramps, sore feet, and other physical problems often associated with running. Of course, if there’s one drawback to any type of sandal, it’s that they often stink. While these sandals can certainly smell funky after extended use, cleaning them is a snap. Simply toss them in the washing machine and then allow them to air dry. Your running shoes can be the absolute top-of-the-line, but you’re still risking discomfort and even injury if you don’t wear the right kind of socks. These no-show, cushioned running socks help keep your feet dry, cool and free from a variety of potential injuries. The unique Drynamix fabric pulls sweat away from your feet. Plus, mesh panels made from reinforced microfiber provide plenty of ventilation. Your feet will stay cool and dry, even during long runs in hot weather. Each sock is made from 200 needle-count fabric, which is not only comfortable but also provides high-impact cushioning. Additionally, an enhanced Elastane band around the ankle helps prevent the sock from slipping down into your shoe. A hand-linked seamless toe box prevents chafing against the top of your foot, while both the heel and toe are reinforced with extra padding. Not all socks are the same. 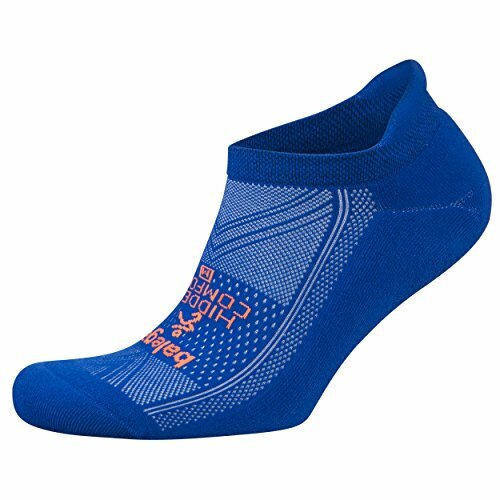 You’ll want socks such as these, specifically designed to protect against the unique stresses caused by running. 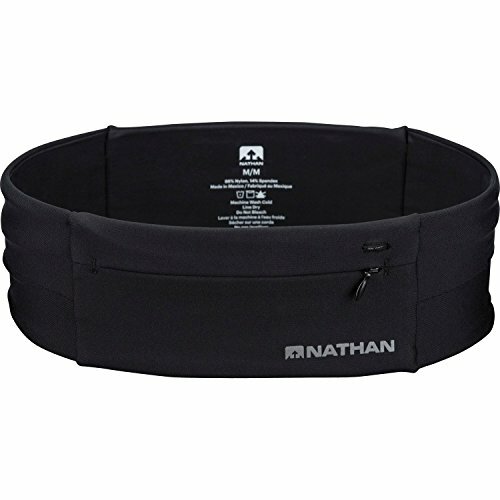 This low-profile belt holds a variety of essential gear on your person without affecting your ability to run. It features two zippered pockets plus two stash pockets. A flexible fabric provides secure, stable storage for keys, wallet, smartphone, and other essentials. The zippered pockets are weather resistant. They’re a good spot to store electronics. The belt will easily fit any smartphone models the size of an iPhone 7 or smaller. Because the pockets and storage space are made from flexible fabric, your items won’t jostle around when you run. Heavy items won’t bang into your hip while you’re moving. Plus, you have two storage options. The zippered pockets are ideal for valuables you want to keep on you but probably won’t need to access frequently, like your ID. The stash pockets aren’t quite as secure, but they’re easier to reach into while running. They’re a good place to store energy gels, water, and other running essentials.